Google Alerts is easy to use and it will email you results on a regular basis. Type affordable wedding photography in the search field in GoAlerts and you are set. If you are looking for the exact term, please add quotation marks. Bingo! Google will now email you once a day the results of its search. When you book your photographer, deactivate the alert. Done! Find an affordable photographer using Google Alerts. Contact the photographers whom you love and follow them on Facebook, Twitter, Instagram, you name it! If their prices and packages are above your budget, wait for a promo photographers usually post on social media. Also, you can ask them to refer you a low-cost colleague to document your Big Day. Many brides consider myself a reasonably priced wedding photographer. I also know quite a few people who offer affordable prices should you have a very low budget. There are hundreds of specialized services providing quotes from reasonably priced photographers. How does it work? The bride provides the wedding day and budget and photographers bid on the job. The websites then allow you to compare prices. Others list the photographers' profile and prices. Here are a few of the websites you want to use. Eventective, Snapknot, Weddingful. All of the above allow you compare the most affordable prices and packages on the market to get the best deals possible. 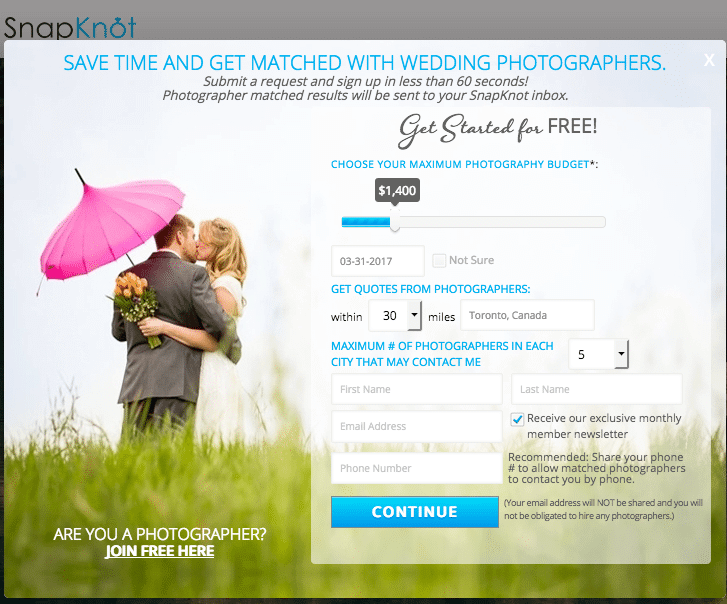 Use SnapKnot to find a reasonably priced wedding photographer in your area. Blogs have vendor collectives and you can definitely find a reasonably priced photographer in this list of 100 wedding blogs. Even better, if you don’t have the time, I did the work for you! Here is a comparison of Toronto prices from 50 studios. Enjoy! Another great way for the price conscious bride and groom to leverage social media and the web is to post on photographer groups. As you can imagine, there are a lot of Facebook photographers groups and web forums. Also, by attending photographers Meetups you can find many budget friendly photographers. Here is a " link to groups and meetups. should you want to follow that road. I am sure you can find someone offering competitive wedding packages. As a Toronto wedding photographer, I hire students. Without a doubt, educational programs give students solid technical foundations. Still, schools don’t teach photographers basic business skills. As a result, many graduates and students are unaware of the market prices and charge very low fees. Admittedly, such photographers will not succeed in business! Yet, if they deliver your wedding and engagement photos, you should be fine. Ryerson, Humber College and Seneca College offer educational programs in the GTA. A destination wedding costs about half a local event in Toronto and many photographers want to enter the destination wedding photography market and could document your big day for free. You will still need to cover the transportation and accommodation for the photographer, but not her fee. Some photographers including myself include an additional engagement photo session in the package. A very quick way to find low budget photographers are classified portals. Searching on classified sites such as Kijji and Craigslist will allow you to find lots of budget photographers. While most of their photos are often cheesy and of low quality, sometimes you find a talented photographer under $2,000. My recommendation is for you to post an ad on Kijiji and Craigslist. Kijiji scrambles emails so there is no risk to be called by every photographer in town. Also, check periodically the postings and you might be lucky. As you can see in the image below, the company also provides beside coverage: an online gallery, an engagement photo session, 2 professional photographers, a wedding album and video, images from your special day on a USB memory stick. 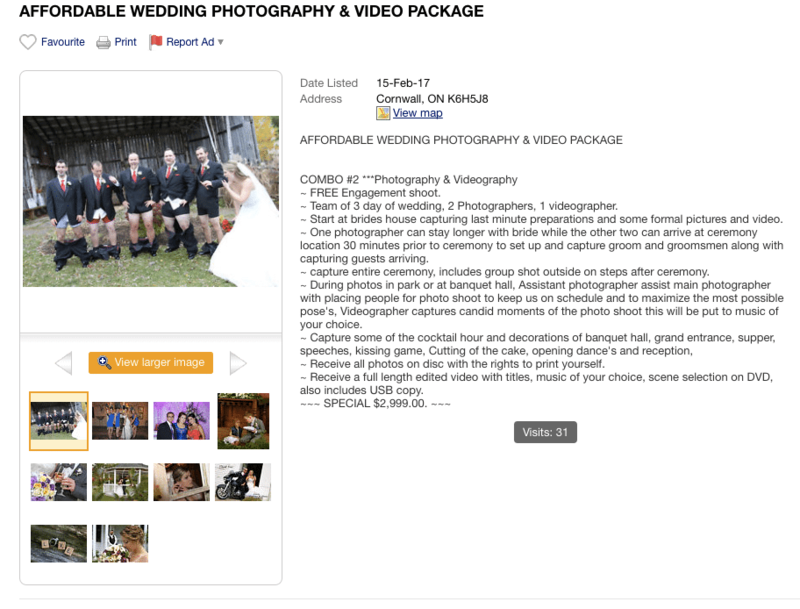 This Kijiji ad was posted by a low-cost wedding photographer and proves that you can not expect good quality at such a low price point. Quora is a perfect platform to ask questions and receive answers from experts in the field. Why not use it? Simply login with your google or facebook account and ask the question "how can I find a cheap wedding photographer near me". Even better, check their large answers database and maybe another bride already asked that question before. Done! Here is an example of answers to a bride looking for "good and affordable wedding photographers in Toronto"
Are you going to have the most amazing Star Wars themed reception? Are you getting married in a unique location? King Edward Crystal Ballroom, I am looking at you! If that is the case, I bet most photographers will give you a great deal to have such an event in their portfolio. During bridal shows, many photographers offer promos to attract engaged couples. As such, visit the shows on an opening day and collect marketing materials. When you get home, compare them and select the least expensive photographers. If you like their work, book them. As a bonus tip, attend shows outside large metropolitan areas such as Toronto. For example, a show in downtown Toronto is over $2,500 and low-cost photographers cannot afford it. There are a lot of forums and discussion boards where you can find your ideal vendors. Yes, some vendors pose as brides but you can easily spot them. Even better, message the brides who post there and ask them feedback on their vendors. In the industry, many vendors cross-refer business. Even more, they offer bundle deals. First of all, that saves you time getting a list of vendors referred by someone you trust. Second, often the photographers offer a slight discount if say a cheap wedding venue referred you. Also, photographers will treat you better when the wedding venue sent you. After all, nobody wants to ruin a good business partnership by providing bad quality. If your budget is really low, you can ask a friend to photograph your special day but do not expect good wedding pictures. Why? Weddings are difficult to photograph, no matter if your friend has the best camera in the world. Trust me on this one! Call your friend only if you have a really low budget for photos. So many things can go wrong only to ruin your wedding photos and your friendship that I do not recommend it! You are better off booking a cheap photographer. Still looking? If that is the case, ask your friends if they know a bargain wedding photographer. Also, I have noticed smart budget brides inquire on Facebook about photographers. Just post and wait for your friends to refer you their photographers! Every year I receive a lot of inquiries through this channel. Also, many photojournalists provide great offers when a former client refers a new couple. I know I do! Websites such as Groupon, WagJag, RedFlagDeals, Buytopia, LivingSocial, Tuango, are full of great offers. Unfortunately, the wedding pictures quality is usually not as good as their prices. Also, be aware that many vendors going out of business post on these websites. A few of my price-conscious brides tried to cut their cost, only to realize the quality offered was terrible, so they booked me in the end. As usually, buyer beware! Google ads that appear on top of the page can help you find your budget-friendly photographer. Just google the search terms Toronto wedding photographer under $2000. To increase your chances, search at different times of the day on different days of the week. Why so? Because cheap photographers have low budgets, their Google advertising campaigns can run only a few hours a day. Here is the result of a search for the terms Toronto wedding photographers under $2000. [caption id="attachment_749" align="aligncenter" width="600"] Cheap Toronto wedding photographer under $2000. When analysing their wedding packages, it proved that actually, a regular 10 hour day of shooting cost over $2000. Tip1: Avoid Fancy Downtown Studios or Photographers who Run Print, TV and Radio ads. While fancy studios might pose as affordable, they are in fact expensive. Stay away from companies who run print, radio, TV or billboard ads. Those costs add up quickly and to cover their advertising costs, studios overcharge couples. Also, avoid downtown photographers! Why is that? Well, rent in a downtown studio can cost up even 10, 000 per month. Who is going to pay for it? YOU! Most venues have preferred vendors lists. Seemingly, that is a great way to find your bargain photographer, but in fact, it isn't true. Why? Often establishments charge listing fees that photographers will pass onto you. While you might think you are getting a great deal, you will, in fact, pay above-market prices. Hiring a cheap wedding photojournalist puts your photos at risk. As usual, please do your homework and make sure you are not making a decision based only on price. Quality is also important! If you are getting a great price and good quality, now that is a great deal! Please read about the risks of hiring a cheap wedding photographer in this article. 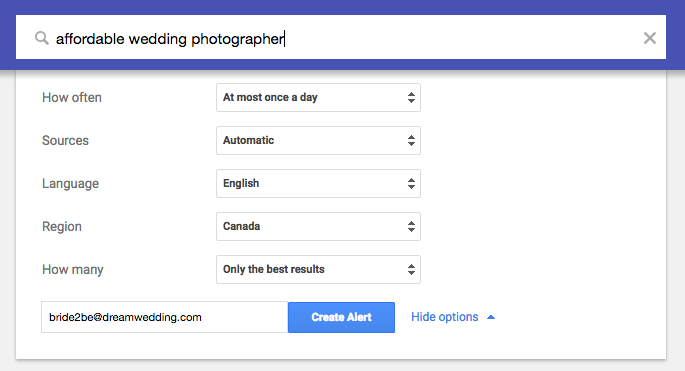 Create a google alert for the keywords: "affordable wedding photographer" or "budget wedding photographer" or "cheap wedding photographer"